If you want to generate more organic traffic or build links, your campaigns have to perform well. There isn’t any cut-and-dry formula for crafting successful posts or running effective marketing campaigns. There are tons of suggested formulas, tips, and tricks out there. But not all of them are worth your time or energy. And it can be hard to find formulas and elements of a campaign that are actually proven to work, based on data. Luckily, the folks at Fractl examined 759 different content marketing campaigns from 2013 to 2017 that can teach us a lot about what successful campaigns usually look like. Here’s what these 759 campaigns can teach you about link building and organic traffic. Fractl’s Director of Marketing, Kerry Jones, decided to gather data from 345 marketing campaigns and share it to help marketers improve the quality and effectiveness of their content. A few years later, she tried the same tactic with data from a sample of 759 campaigns to see which elements lead to the most social shares and placements. The findings of both sets of data seem to lean toward the idea that content with a positive emotional impact is shared the most. And social shares and placements can help you build links and organic traffic, as well as credibility. Fractl found three factors that led to the most successful campaigns. 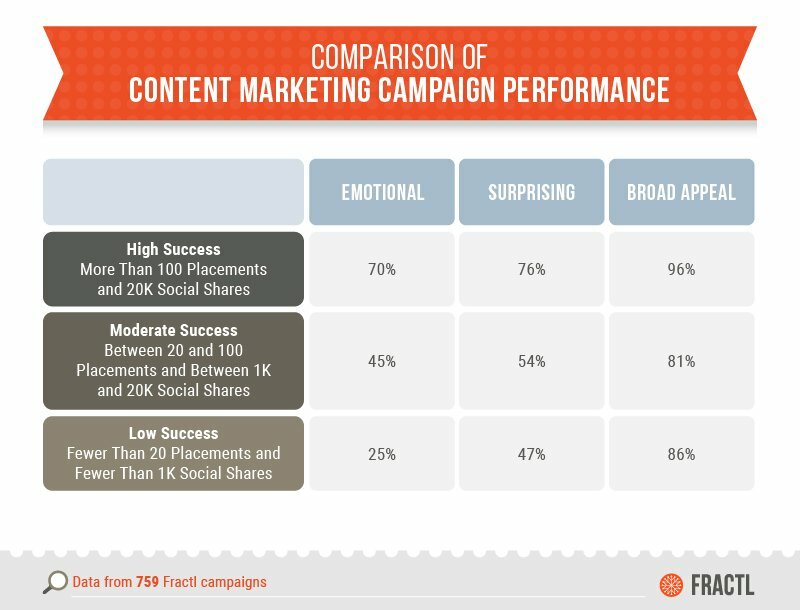 Fractl’s campaigns that were surprising or emotional were more likely to yield tons of media placements and social shares than content that wasn’t. 70% of high success campaigns featured an emotional hook, while 45% of moderate success and 25% of low success campaigns also played on emotion. 76% of high success campaigns were surprising, while 54% of moderate success and 47% of low success campaigns also featured surprising elements. This trend isn’t anything unusual. According to CoSchedule, posts with a higher emotional value tend to get more shares. There wasn’t as big of a difference in campaign success when it came to whether or not they appealed to a broad audience, but it still played a role. 96% of high success campaigns had broad appeal, while 81% of moderate success and 86% of low success campaigns also featured broad appeal. Let’s look closer at each of those three factors to understand how each of them can help you build links and organic traffic by increasing your social shares and placements. If you leverage the power of emotions, you can drive up more shares and engagement on your content, no matter the kind of campaigns you’re running. Campaigns analyzed by Fractl with an emotional hook gained 70% more pickups by media and 127% more social shares than campaigns without them. Campaign data proves that non-emotional campaigns don’t see the same success as those with emotional resonance. And one of the best ways to hit on emotion is with imagery. Images that strike a nerve with viewers are more likely to become viral, even if they elicit hate, anger, or disappointment. But it’s best to keep it positive. Creating positive emotional reactions will garner the right kind of attention and encourage shares since people want to share what makes them feel happy. You can also choose to send the audience on an emotional rollercoaster throughout your campaign. Life is full of contrasting emotions. Everything isn’t always black and white. Pair emotions that contrast one another, like hope and sadness, to make your campaign truly memorable or relatable. If you choose to feature negative emotions, then pair them with something positive. But steer clear of being too logical, or your campaign might lose some traction. Almost one-third of marketers have found an increase in profits when running emotional campaigns in the past. But when they introduce logic, that number dips. That’s why it’s important to walk a fine line between emotion and logic. Emotional branding will take your content a long way. Most major brands use it. They appeal to status, youthfulness, or the idea that their product can improve your quality of life. Take this ad from Coca-Cola, for example. “Open the happy can” implies that your day will be happier once you drink a Coke. Apple is another “super brand” that executes emotional branding well. Their entire company is built around the idea that their products can make your life easier or help you solve your problems. People like to feel like they can bond with brands that understand their needs or beliefs. And advertising research shows time and time again that the emotional response to ads influences customers to buy more than the actual ad itself. We see this with Super Bowl commercials. The most viral ads play on viewers’ emotions to create a sense of connection with them. This 2018 Super Bowl commercial from Toyota is a perfect example. It focuses on how Lauren Woolstencroft, eight-time Paralympic gold medalist, beat the odds stacked against her. The ad inspires viewers, resonates with them, and gets them talking. Dove’s Self-Esteem Project goes after a similar consumer reaction. Even the name “Self-Esteem Project” appeals to emotion. The project’s page says: “When you choose Dove, you help girls build self-esteem. We’ve reached 15 million young lives with our self-esteem education. This means that when you buy Dove, you’re spending money on more than just their soaps and hygiene products. They use profits to teach young women about self-esteem. These themes, like personal struggle and self-esteem, are universal ones. They hit a nerve with most viewers. So how can you implement this if you’re a B2B brand instead of a B2C company? You’re in luck. B2B buying is actually more personal than B2C. All you’ve got to do is play on emotion and make consumers feel something when viewing your ads, and you’ll be a step ahead of the competition. You’ve got to keep things surprising, too. The campaigns analyzed by Fractl that were surprising earned 39% more pickups by media and 108% more social shares than campaigns that were missing surprising elements. That’s why it’s best to keep things unpredictable. But surprise doesn’t mean that you need to shock people. Even novelty can cause people to feel surprised because they’ll have access to information that may not be readily available or that they didn’t know already. This encourages them to share it with others. For example, if you introduce a new product and share it as an exclusive offer, the novelty can improve your outreach efforts. That’s also why it can be a good idea to offer the media a fresh story or idea that’s never been published before. Everyone loves to hear a good story. And surprises create memorable stories. For more than 20 years, the top-grossing movie genres have been unpredictable ones. Think about all of the best movies you’ve seen over the years that depend on the element of surprise to tell a great story. Star Wars, one of the top-grossing film series of all time, featured one of the most surprising cinematic reveals in history (SPOILER ALERT): the fact that Darth Vader was Luke Skywalker’s father. These surprise tactics work because audiences become invested in stories, and the surprise packs a dramatic punch that mixes up the plot. With the element of surprise tucked into your toolkit, you can breathe life into your brand through storytelling. But be sure to make your surprise a good one, not a bad one. An example of a good surprise would be Ellen giving away products to the audience members of her show just for showing up. This is a tactic she uses to build her brand. And the winners of Ellen’s “Twelve Days of Giveaways” create brand awareness by posting about their winnings on social media. A bad surprise, on the other hand, would be an online coupon discount on a brand’s website that went missing. For example, say you receive a surprise discount code for 20% off when checking out of an online store. You enter the code and learn that you’ll get $5 off of your purchase. But once you have paid and you receive your email invoice, you learn that you were charged full price. An example of an even worse surprise would be Google’s “Mic Drop” feature that they introduced as an April Fool’s joke in 2016. But the button also attached GIFs of minions from Despicable Me, even if the emails were serious business threads. Luckily this was an April Fool’s joke. But that’s why you have to handle surprises properly. Align any unpredictable campaigns with your brand’s image. Never take it too far or implement a “bad” surprise, no matter what kind of brand you are. That brings us to the importance of the third factor: appealing to a broad audience. Broad appeal won’t cause your campaign to have overnight success. But it helps you get your campaign in front of as many people as humanly possible. Fractl research shows that campaigns appealing to a broad audience received 38% more media pickups and 96% more social shares in comparison to campaigns that ran for niche audiences. By creating content for general audiences instead of niche audiences, you’ll have a larger potential audience reach. Niche campaigns have limited reach because mainstream general news sites don’t care about many stories that don’t feature mass appeal. Instead, you’re limited to niche publishers who think that your topic will bring value to their niche reader pool. That’s why Fractl creates tangential content. This is content about popular topics that relates to a client’s vertical. Niche marketers make it clear about who they’re serving and how they’re serving them. General marketers, on the other hand, spray efforts toward wide audiences and try to hit a few interested buyers. Here’s an example of a company using niche marketing, Oberlo. Oberlo helps e-commerce brands import drop-shipped products into their stores and ship them directly to customers. Their services appeal to a very specific audience. But just because you’re a niche brand doesn’t mean you can’t appeal to a broader audience. You can appeal to others by simply relating to them. For the best results, you should combine emotion, surprise, and broad appeal. Emotions and surprise work well on separate occasions. But when these factors were combined together and used to appeal to a broad audience, Fractl found even greater success. Campaigns that played on both emotion and surprise earned an average of 199 media pickups and 23,730 social shares. But campaigns featuring all three factors had the best results, on average. Campaigns that were emotional, surprising, and broadly appealing racked up 207 pickups and 25,017 social shares. And all three of these factors can contribute to the buyer’s emotional journey. The buyer’s emotional journey begins with the trigger event and introduces the buyer’s sensory perception of the campaign before the user has a chance even to react. Based on their response, the viewer may have an impulse reaction that could lead to an impulse buy. Once the viewer evaluates their reaction and their emotions, a deliberate choice will be made. This is where they’ll decide whether or not to purchase your service or product. Content featuring these three traits also has strong headline potential, which publishers will notice immediately once they read your pitch. Publishers will love that it will be easy to write an eye-catching headline if they choose to publish your campaign. This great headline will draw in clicks and views to your story, which helps build links and content shares. Here are some emotional word examples that you can use in headlines and pitches to boost traffic, according to CoSchedule. One easy way to hit on emotion, surprise, and broad appeal is to use the word “confess” or “confessions” in your content. That’s one reason why Buzzfeed publishes so many “confession” posts. If you came across an article or post that claims to be a “confession,” it would be hard not to click, right? When crafting headlines, use the free CoSchedule Headline Analyzer to gauge its success. The tool will even give your headline an “emotional” score. Audiences love emotional, surprising, and universally-appealing content. But these factors aren’t just helpful for winning audiences over. They’re helpful for improving your outreach pitch and winning over publications. Making your content emotional, unpredictable, and broadly appealing won’t automatically solve all of your problems. There are tons of other variables that can make or break your campaign, too. Which ones can you control to boost your shot at a winning campaign? Amazing, well-crafted content won’t get any media pickups if your outreach is less than perfect. That means that mass pitching to a long list of different publishers isn’t the best idea. Instead, you need to choose the correct targets for outreach. Pick publishers that will actually be interested in publishing stories about your campaign topic. Then, choose the right person at that publication to pitch to. Find the person who writes about similar topics regularly. If you need to, you can even use this time to do some social media micro-influencer outreach since they charge less per post than most full-blown influencers. This way, you won’t be alienating different writers by sending out pitches that don’t really apply to them. It also helps to send out personalized pitches to each person you’re trying to target. Once you send a solid pitch that they connect with once, they’ll be more likely to work with you later on. And customer outreach is just as important as media outreach. You want to be sure that past customers are satisfied with your product once they commit to it and make a purchase. Email is the best customer outreach method, followed by social media. You also need to prove your credibility to be trusted. If your campaign is inaccurate or controversial, you’ll lose trust with your audience and publishers. That’s why you need to make credibility a top priority. Even your brand’s web design can affect your company’s credibility. How can you be sure that your content is credible? For starters, only use authoritative data and sources like government websites, publishers with high editorial standards, higher education websites, or peer-reviewed journals. Avoid user-generated content, studies backed by corporate entities, websites without editorial guidelines and rules, and branded websites. You also need to be sure to check for errors in your campaign. You won’t want any factual or grammatical errors ruining all of your hard work. To check for grammatical errors, use a free tool like Grammarly. You can use it to find spelling, punctuation, and word usage errors in your content. Be sure to include editorial guidelines, fact-checking, and quality checks in your campaign production process to avoid any costly mistakes. Your campaigns have to generate some kind of success to build links and generate more organic traffic. But there isn’t any single tried-and-true formula for campaign success. Keep your campaigns interesting by playing on the audience’s emotion. All of the best brands do it. Tell them how your product or service can improve their life. Be unpredictable, too. You want to tell a good story. Don’t give too much away up front. Appeal to a broad audience to reach as many customers as possible. If you’re a niche brand, try and relate to a wider scope of people. Combine these three factors in one campaign to get the best results possible. Focus on outreach and credibility, too. Excellent outreach will rack up more media pickups, which can help you build traffic and links. Double check your campaigns for data errors and grammatical mistakes before sending them out. No one wants to share a campaign that needs cleaning up. How are you going to make your next campaign more emotional, surprising, and broadly appealing? The post What 759 Content Marketing Campaigns Can Teach You About Link Building And Organic Traffic appeared first on Neil Patel.